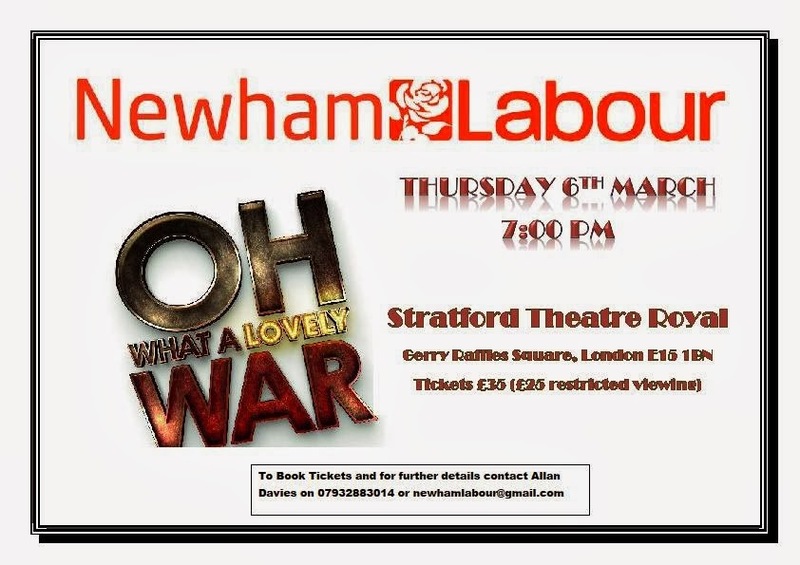 John's Labour blog: "Oh What A Lovely War"
I am just back from watching a performance of "Oh What A Lovely War" at the Theatre Royal in Stratford East. The show was first performed at this theatre in 1963. The theatre tonight had been fully booked by Newham Labour Group as a fund raiser/social. I really enjoyed the performance and thought it was much better than the 1969 film. Most of the songs in the show originated from the musical hall era and it just seemed to suit the snug and traditional Theatre Royal which was first built in 1884. I suspect many of them were actually song on that stage at patriotic performances during the war. Other songs from the show I remember singing (badly) during various route marches in my youth when I was a cadet and a member of the Territorials. Tory Education minister Michael Gove has attacked this show and others for "peddling left wing myths" about the first world war which he describes as a "noble...and just cause". Which is just nonsense. While the show was not a BBC History production about the rights or wrongs of the war, it accurately reflects the humour and heroism of the British Tommies amongst the senseless and often futile mass slaughter. According to family folklore, my maternal Grandfather (or Taid in Welsh) who served on the front line during the first world war from 1915-1918 use to go on his leave to London and blow all his pay on "entertainment" including theatres and music halls. I wonder if he ever came down to a East End sing-a-long in Stratford?